Australia has produce some of the finest and largest gem quality sapphires in the world. Carved from Star sapphire found in Central Queensland. These are busts of the American Presidents Lincoln (1318cts), Washington (1056cts), Eisenhower (1444cts) and Jefferson (1381cts). A fifth bust of Martin Luther King Junior has also been carved from an Australian sapphire that originally weighed 4180cts and the finished weight of the carving is 3284 carats. 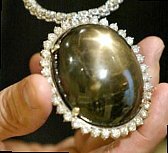 A 13.01 ounce (2020ct) yellow sapphire found in 1979 at Sapphire. It is believed to be the largest gem quality sapphire (for faceting) ever found. It was stolen in 1980 and recovered in 1986 and is believed to have been sold into the USA for a multi million dollar figure. Found at the Washpol in 1993 was originally 103.5cts. This superb oval brilliant yellow to orange sapphire has a cut weight of 30.25 carats. It has been conservatively valued at $300,000. "The Autumn Glory" disappeared when recently sent to the USA. It has still not been recovered, but investigations are continuing.